Sometimes I hear about a book and promptly put it on reserve at the library. Such was the case with Star Wars: Thrawn by Timothy Zahn. Thrawn is the charming, brilliant villain of the landmark Thrawn Trilogy, the three books that probably set the path of the Star Wars universe prior to the new movies—and are the major sticking point for me in not wanting to throw out said-extended universe. But this new book, after the demotion of the other books, writes Thrawn back into the official Star Wars canon, with a prequel set just before A New Hope. It wasn’t all I hoped for—and was an oddly un-Star Wars book—but was great fun to read all the same. 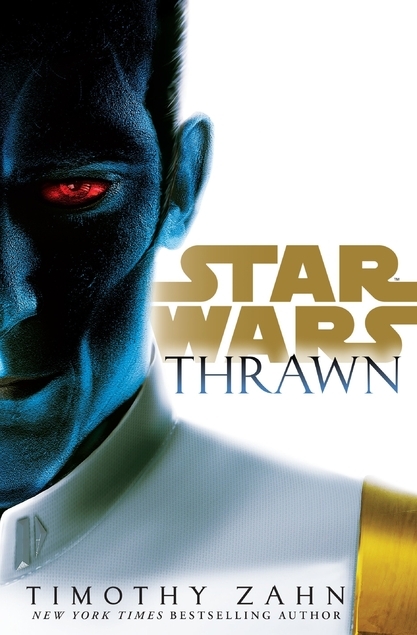 This book charts the rise of Thrawn within the Empire. He belongs to a race called the Chiss, who are known only by legend within the reaches of the Empire. He’s found alone on a planet on the Outer Rim and impresses the Imperials enough to be taken back to Coruscant—where he briefly meets the Emperor, who takes an interest in his career. From there we watch as Thrawn, and his interpreter/protégé Eli Vanto, work through the Imperial Academy and up through the ranks. Meanwhile on a parallel path, Arindha loses her family’s mine to Imperial takeover and sets out to wrest power back through rising in the Empire’s political structure. This was a very good and engaging book that felt…not very Star Wars. Most of the usual hallmarks were missing. None of the film characters appeared or even were referenced, save a brief cameo from the Emperor and a briefer one from Darth Vader. The Rebel Alliance is barely a whisper at this point, and while readers can guess that the Empire is buying up great quantities of a special metal to build the Death Star, that never takes front stage. In a mostly human Imperial navy there were few recognizable alien species, and with the Jedi gone I don’t think the Force came up even once. This actually felt oddly like a Star Trek book, considering it involved first contact on the edges of known space, followed by a focus first on the naval academy and than said-navy traveling through space. The Empire from inside the Empire didn’t look that bad. A little bureaucratic with some corruption, sure—it’s not actually the Federation—but in the broad strokes it didn’t look that different. So I don’t know that I can say this was a good Star Wars book…but it was a good book. I enjoyed Thrawn as a protagonist, even if he underwent some metamorphosis since the Thrawn Trilogy too. It’s been a while since I read those, but I remembered Thrawn more ruthless than he appeared here. (Or maybe he was simply at odds to the characters I cared about more?) He’s still a brilliant tactical genius, with his wonderful trick of learning everything about fighting a species by studying their art. Eli does well in the role of Dr. Watson/Captain Pellean (of the Thrawn Trilogy), clever enough to see what Thrawn is doing but relatable enough to explain it to readers. He’s also on his own arc, initially derailed from his life plans by this strange alien, and I enjoyed the growth of their camaraderie. Arindha is an interesting study. Only loosely connected to Thrawn she’s largely on her own storyline. She starts out sympathetic, badly-burned (metaphorically) by the Empire and determined to win back justice. But as the book progresses, Arindha gradually demonstrates that she is not actually a viable candidate for the Rebel Alliance—at least, not the general good guy Alliance of the original movies. Maybe Rogue One would have room for her. The moral grayness shading to black may actually be the point of Arindha. She’s the contrast to Thrawn. The rising officer in the evil Empire has a strong moral compass and a respect for life, while the downtrodden citizen seeking justice (or retribution?) turns out to be far morally darker. Which was interesting. I have to confess I hoped this book would be quite different. I hoped writing Thrawn back in meant a new imagining of the time period of the Thrawn Trilogy in light of the new movies, which obviously this wasn’t. But I see the challenge in doing that; with new movies and new information coming out, there’s nothing to say another book wouldn’t turn out contradicted. So actually, Zahn did something pretty brilliant. By setting his book before the split in the parallel universes (film and Extended Universe), it works in both. It can align with the Thrawn Trilogy, but could just as easily align with whatever future the new movies will go on to reveal. Well-played. In a weird way I’m not sure I can really recommend this as a good one for Star Wars fans because it’s so far distant—but I guess I maybe can, only it’s also a good one for science fiction fans in general—because it’s so far distant! I give the original Thrawn Trilogy the edge, but it is my favorite Star Wars books so that’s a high bar, and this was a cool additional piece to the galaxy.